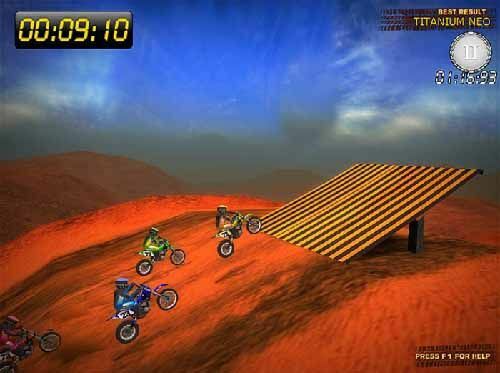 Free download Desert Moto Racing game for PC. It is a PC game having no huge system requirements. It is simple but 3D game which gives beautiful graphics. The plot which has been created in the game is a desert. That is why it names as Desert Moto Racing Game. Basically it has two types of modes. One is Ghost Racing and other one is Racing Contest. Ghost racing is actually racing with you. For example you have you have given your best performance and completed a race in one minute only. Now in Ghost race you have to break your own record on one minute. This is for increasing your efficiency and performance level more than precious one. On the other hand, in Racing Contest you have to compete with other players in the game. Along with this you have to maintain your game score properly by winning medals. The next level of the game will be unlocked when you will get medals. In every next level you can enjoy new tracks and motorbikes as well.